First of all, yes, this post is named after the most famous line from Star Trek. That is what happens when your childhood consists of Star Trek on a Sunday afternoon. I even remember trying and failing and trying again to do the weird Vulcan hand gesture that goes with this farewell… because that’s what it is, a farewell. Yet this farewell isn’t sad. It’s one full of hope that whether or not you see the person again, they will have exactly what you wish them to have: a life that is full and prosperous. The crazy thing is, most of the time it can feel like achieving that type of life is out of reach. Why? Because we spend our lives walking around under the impression that somehow we don’t fit in the world we live in. I see this whenever I start to talk about my… well, life. Let’s start at the beginning. I’ve already admitted that I’m part-Trekkie (anyone else?) but that’s before I even mention knowing more about Shakespeare than Buffy or I listened to more Radio 4 than Radio 2 growing up. (I would like to say the radio choice wasn’t my choice though.) Whether you are at school, in university, or have an actual job, being able to list over five Knights of the Round Table, analysing the MCU for fun, and reading Elle are not things you expect to find in one person. Yet they are all things that I love, along with cooking pasta and wearing maxi dresses and collecting Disney films with my sister. Do you know how I describe this life? As a walking oxymoron wrapped up in a contradiction. You’ve probably got some questions about that. Well, two questions anyway… What’s a walking oxymoron? Why are you wrapped up in a contradiction? Because combining the two is just a weird thing to do! Let’s start with being a walking oxymoron. Oxymoron is defined as a figure of speech where two contradictory terms are used together. The Urban Dictionary claims that a walking oxymoron is a person with a name that contradicts itself, like being called Scott English. However, for this post a walking oxymoron means to be a person who somehow manages to hold to contradictions within themselves… or at least be a person who feels that way. For me, this means being a whole host of characteristics that don’t seem to quite match up. I’m a total romantic who thinks that Keats and Blake were the greatest poets ever to write. I’m also a realist who knows that men like Aragorn or Tom Paris do not exist and even if they do, they are few and far between. (To be honest, even Tom Paris took several series of Star Trek Voyager to come good.) I love Shakespeare and Star Trek in equal measure… though considering Patrick Stewart is renowned for both, maybe that’s not such an oxymoron. I’m happy reading Elle and Vogue or obsessing over the Marvel Cinematic Universe to the point of watching theory videos on YouTube. Looking at those today, you might think that it isn’t such a contradiction. Yet growing up, I felt that nothing about who I was matched up. 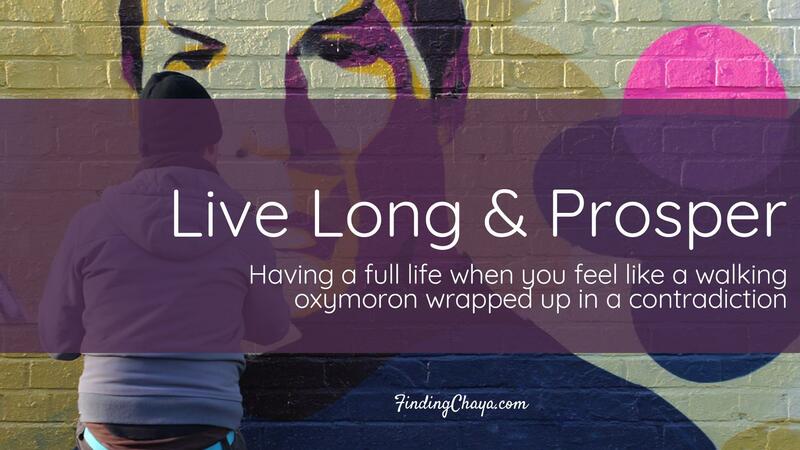 I was convinced that I was a complete oxymoron, once I discovered what that word meant. So where did the “wrapped in a contradiction come from”? The thing was I never felt like I fitted in. And I doubt I am the only girl or woman to have ever felt this way. No matter what happened, there is a group of us who never say the right thing. We reference Once Upon a Time in the middle of serious bible studies and consider the Hogwarts Houses to be a sensible way of evaluating our values. It might not be fantasy and geekdom for you but if you’ve ever said the wrong thing at the wrong moment, you know what I mean. We, my friends, are the walking contradictions. The ones who, no matter how hard we try, will never feel like we fit in. There is something about us that contradicts society itself. We don’t know what it is but something in us actively rebels against fitting in. Sometimes we do it on purpose. Sometimes it just happens. So how do we survive this walking oxymoron of a life wrapped up in contradictions? I’ve always been drawn to personality tests as a way to try and help me figure out where I fit in. From Myers-Briggs to the Enneagram, even Motivational Gifts thanks to a friends introducing me to them. Being told I was an Introvert or Type 4 or Mercy Motivation somehow made it understandable that I didn’t fit in. It gave me reasons; too emotional, too individualistic, too empathic. The thing is, these personality tests only ever told me why I didn’t fit in. It was like a chocolate fondue. Great at the time but the fun only lasts for a few hours. Eventually, it just becomes the norm to describe yourself according to this test or that and suddenly you’re back at square one. Walking around, wondering why we’re at such odds with the society we live in. The reality is that when you feel so oxymoronic that you think you’re a moron, we can’t change it. There is only one person who is able to change the way you feel about yourself. Only one person who can take you from oxymoronic moron through to loving your oxymoronic life. John 3:16 is one of the most famous passages of all time. Yet we forget what comes after it. John 3:17-21 tells us how Jesus came into the world to save us, not to condemn us. That when we choose Jesus, we move into the light and out of darkness. The truth is that when we meet Jesus and accept who He truly is, we don’t lose the contradictions or leave the oxymorons behind. They are part of us, part of who we were made to be. What changes is how we walk. We are choosing to walk in the light of Jesus, not in the shadows where everything seems terrifying and huge. Sure, sometimes it may seem dark but even then there are the stars and the moon shining on us to remind us that we walk in Jesus’ light. A light that shows how the things that stopped us from fitting in can enable us to reflect Jesus into the world. I am not too emotional, individualistic, or empathic. I care deeply for and with the people that God has placed around me. I long to see my friends fully embrace the unique and amazing people I know they can be. I have a heart that prays every time I see an ambulance flashing past. (Okay, I’m don’t get it right all the time but you get the idea.) The very fact that we are walking oxymorons wrapped up in contradictions is where God can most powerfully use us when we let Him. Spock, and the writers of Star Trek, probably meant something very different but here is my take on that well-known saying. 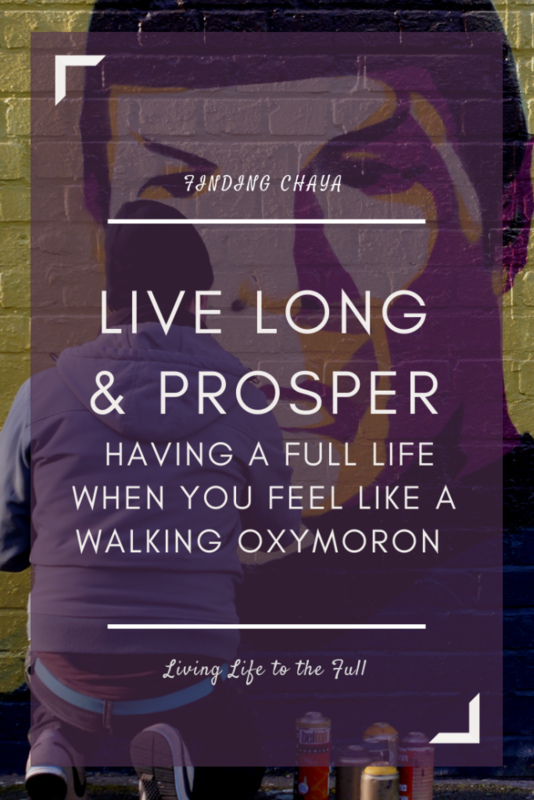 To live long and prosper does not have to mean a long life of success, riches, and respect. It is a life lived out knowing Jesus; knowing that we are saved because of what He did, not what we are doing.